But wait, there’s more… Stanley Energy is also asking for Forest Service approval to drill for natural gas in the Wyoming Range. They want to drill from 8 locations just west of Merna, between Lookout Peak and Prospect Peak. They plan to drill multiple wells from each location, or “wellpad,” which helps reduce the environmental impact…but they expect each wellpad to be 50 acres in size. How big is that? Well, the Pentagon covers 34 acres. Why so big? In the Gulf of Mexico the oil industry drills dozens of wells from a single platform less than 2 acres in size, in water a mile deep, to targets 3 miles below the seafloor. 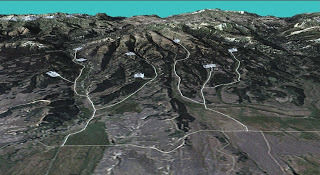 We thought it would be useful to simulate what 50-acre wellpads might look like in the middle of a national forest. Check out our image gallery showing before-and-after pics of the site. 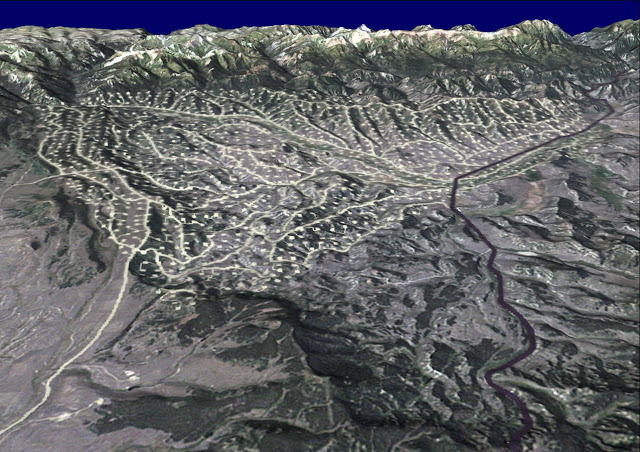 And for the very first time, we’ve also created this simulation in Google Earth. 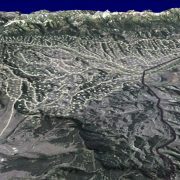 Earth users can download the KMZ file here. Don’t have Google Earth yet? Get it for free and then take a self-guided virtual tour of SkyTruth’s simulation. Back in October the Forest Service and Stanley signed a memo that some folks — the governor of Wyoming among them — claim gave Stanley too much influence over the decisionmaking process. This revelation has gotten a lot of local ink; check out coverage by the Sublette Examiner and the Jackson Hole News & Guide. Outdoors editor Shauna Stephenson at the Wyoming Tribune-Eagle started her column on this controversy by saying “I don’t know about you guys, but I’m just about sick and tired of this garbage.” The Casper Star-Tribune editorialized that the whole environmental study should start over. The Forest Service admits it made a big mistake and gave Stanley undue influence over the environmental study, but is continuing ahead with it anyway. Meanwhile, Senator Barasso of Wyoming has carried on the cause of his predecessor, the late Senator Craig Thomas, and submitted a bill to protect 1.2 million acres of land in the Wyoming Range from future gas and oil leasing. The legislation was just approved by the Energy and Natural Resources Committee and will come before the full Senate for a vote. With support from the Wyoming’s governor and congressional delegation it’s chances look pretty good. Existing oil and gas leases in the protected area — including those held by Stanley Energy and Plains Exploration and Production — will still be “drillable.” But lease holders will have the option of voluntarily relinquishing those leases, and conservation groups will have the opportunity to buy leases and permanently “retire” them, an option that is normally not allowed. You can contact Senator Barasso to let him know what you think about the Stanley – Forest Service debacle, and his bill to protect a piece of the Wyoming Range. Two recent proposals to drill on National Forest land in the Wyoming Range have generated a lot of controversy and some unusual political action. Plains Exploration & Production Company initially applied to the US Forest Service for permission to drill just three exploration wells in the Hoback Rim area, while simultaneously making statements to Wall Street that they anticipated developing a major gas field comparable to the nearby Jonah Field (now approved for thousands of wells and hundreds of miles of access roads). We decided to simulate what the Plains CEO described in the Pinedale Roundup as a “nice little field in the forest.” Our simulation raised a bit of ruckus: local newspapers picked up the story and the apparent inconsistency between what the company was asking from the Forest Service, and what they were telling potential investors. 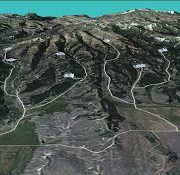 The company withdrew its request for the three-well approval and asked the Forest Service to instead conduct a much more extensive environmental analysis that would allow full-blown development. That analysis should be released for public comment late in 2008. The simulation really made the issue more clear and so generated some great press attention. In addition, it helped to spotlight Plains Exploration Company’s likely intentions, which was borne out later when the company admitted in a letter to the Forest Service that they wanted denser drilling with more wells and roads analyzed in the EIS. As our press release made clear, the simulation was especially effective because it utilized Plains own statements and information from nearby gas fields.